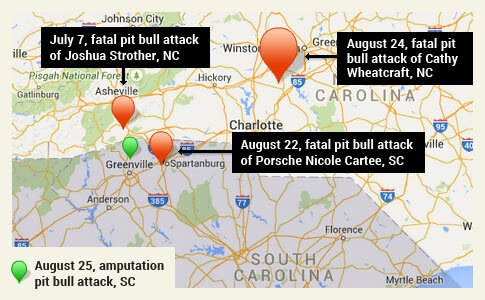 The three recent fatal pit bull attacks mapped - breeders of fighting dogs territory. UPDATE 08/25/15: New information has been released about the fatal pit bull attack in North Carolina. On Monday, Cathy Wheatcraft, 48, was fatally attacked by her neighbor's pit bull. She had just gotten her mail and was walking back to her home when the dog attacked, according to Davie County deputies. The dog "drug her down the yard and fatally bit her," Sheriff Andy Stokes said. The pit bull also attacked neighbor Sheena Truesdale, 31, who tried to help the victim. Truesdale tried to get into a nearby car to escape the animal, but the pit bull continued coming at her. After she got into the car and tried to shut the door, the pit bull latched onto her arm again. The dog was still latched on, trying to pull her out of the car, when a Cooleemee police officer arrived. "If it wasn't for that police man who showed up, [the pit bull] would've got me out of the car, my arm would've been much worse and I would probably be dead myself," Truesdale said. The fatally attacking pit bull was declared a "nuisance animal" in May after escaping its owner's property and attacking a dog. In a strange twist, the victimized dog belonged to Truesdale. At some point before attacking the two women Monday, the pit bull escaped its owner's home through a window. Truesdale is a pit bull fan and owns three of them. Despite what she witnessed and underwent, she does not believe "pit bulls are aggressive dogs." Her death wish is her own. 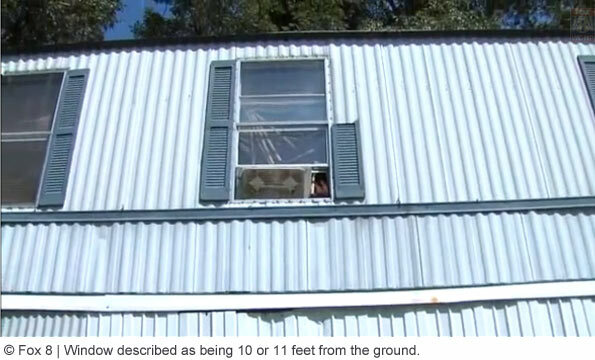 View The Fox 8 segment shows that the pit bull jumped out of a window 10 or 11 feet up. The Davie County Sheriff's Office has identified the fatal dog mauling victim as Cathy Wheatcraft, 48-years old. The woman was savagely killed by her neighbor's pit bull Monday night in front of her home at 243 Clark Road near Cooleemee. At the time of the deadly attack, she was checking her mailbox. The pit bull also attacked a neighbor who intervened to help, 31-year old Sheena Truesdale. She was transported to a local hospital and is in stable condition, officials said. The fatally attacking pit bull belonged to Latisha Young who lives nearby. The dog was normally kept inside her home, but in this case "escaped through a window" while its owner was away at some point before killing one woman and injuring another. Just 3-months ago, the same pit bull was declared a "nuisance animal" after it escaped Young's property and attacked another dog. This time the pit bull escaped its owner's property and attacked two human beings, killing one. The fatal attack of Cathy Wheatcraft marks the third pit bull fatality in this region since early July. On Saturday, in upstate South Carolina, 25-year old Nicole Cartee was killed by her family pit bull named "Spike" in Spartanburg. The dog had been with her family for over a decade. On July 7, Joshua Strother, 6-years old, was killed by his neighbor's pit bull in Hendersonville, North Carolina. The pit bull that killed Joshua was rehomed by the Asheville Humane Society 3-weeks earlier. Today, over in Greenville County, South Carolina -- also in this same region -- a female deputy shot and killed a pit bull that was attacking two women. The pit bull had nearly severed one of the woman's arms before the deputy arrived. After shooting the dog, she applied a tourniquet to the woman’s upper arm and her leg. Master Deputy Jonathan Smith said, "She saved the lives of two people because the injuries were so severe." The dog had been residing with one of the victims. Cooleemee, NC - Another person has been killed by a pit bull in North Carolina. On July 7, Joshua Strother, 6-years old of Henderson County, was killed by a pit bull that was adopted out by the Asheville Humane Society 3-weeks earlier. The most recent fatal pit bull attack occurred in Davie County. Sheriff A.C. Stokes said the attack occurred at about 7:00 pm at 235 Clark Road near Cooleemee. The woman, in her 40s, was checking her mailbox when the pit bull attacked her. A neighbor who heard the woman screaming ran to help and discovered her in the yard -- the person then called emergency responders. Another neighbor also came to help and was attacked by the dog. She was transported to Wake Forest Baptist Medical Center. Her medical condition is unknown. Sheriff Stokes said it was the neighbor's pit bull that killed the woman. The news report video on WXII states that they spoke to the dog's owner who said her "pit bull killed a woman." View the DogsBite.org Google Map: North Carolina Fatal Pit Bull Maulings. 1But a shocker it was given any designation at all! kind of ironic for Huffington Posts #Pitbullweek promotion. If they had any class they would report the fatalities and cancel the promo out of respect for the dead. Did this pit bull come from Asheville Humane Society? animals 24/7 has very interesting investigation into the intense role that NEW YORK ASPCA is playing at marketing and promoting fighting breeds in Asheville, using the Asheville Humane Society as a front. The people of NC are at terrible risk. I did not realize that the SC fatal attack was just a little more than an hour away from the Asheville Humane Society and now this most recent one is just about 2 hours away along a main highway. How many deaths in this area will it take before BFAS, AHS, and ASPCA stop lying to the public and admit that pit bulls are TOO DANGEROUS. EVEN THE FRIENDLY ONES ARE DANGEROUS. Add "checking your mail" to the list of attack triggers. And the surviving victim is a pit bull owner herself and doesn't believe pit bulls are aggressive. What are drugs do these people take?
" Just 3-months ago, the same pit bull was declared a "nuisance animal" after it escaped Young's property and attacked another dog. This time the pit bull escaped its owner's property and attacked two human beings, killing one." This is why pit bulls that attack other dogs need to be put down. Zero tolerance. The pits that attack other dogs go on to attack people. People need to raise the roof about how dangerous dogs are treated in their communities. No tolerance! Tolerate this, and you die. There was another arm amputation in Charleston, SC at the end of July. This was a "gentle" Pitbull, she sais…and it had attacked a dog and two neighbors, killing one. ??? These people are CRAZY! Their stupidity and belligerent denial is ruining our communities. Did you see that baby in the car seat during the interview? I hope the child survives the bad choices the adults around him/her are making. Last time I checked, "dogs" didn't jump out of 11 story windows to attack people. Pits are demons and a menace to the world and more people need to understand that. Worldwide BSL can't come soon enough. Unfortunately, the Carolinas are simply crawling with pitbulls. When I first moved here (Charlotte) about 3 years ago, I thought it was insane when I saw a man walking through my residential neighborhood carrying a club. It was an honest-to- goodness caveman club. I laughed out loud, at what I thought was the ridiculousness of it. What I first thought of as insanity is now the new normal for me. Many if not most of my neighbors carry baseball bats, golf clubs, and other assorted weapons as they go for their morning walks. I've observed 4 different pitbulls running loose in my neighborhood over the past couple months. One of the was standing at my back door (back yard has since been fenced). And it has been this way in both neighborhoods that I have lived here in Charlotte. Both of the neighborhoods are newer, middle class, suburban neighborhoods of a large metropolitan city. The shelters are bursting at the seams with pitbulls. I've met two neighbors whose dogs have been attacked by pitbulls as they walk around our neighborhood. Those dogs are now basket cases when they encounter a dog, any dog. And in this area, I've never been anywhere else in the world where the people have such a terrible fear of dogs as Charlotte, even my yellow lab terrifies 50% of people in this area. At first I didn't understand that either. Of course, now I get it. I stopped taking my own dogs to the dog park, because of the frequent pit bull attacks that happen there. My veterinarian urged me to stop going, even before I fully realized the problem of pitbulls (much thanks for the education, here on DogsBite). My vet has the unfortunate job of trying to piece dogs back together after those attacks. For some reason the people here are simply unaware that people should not have to live in fear as they walk around a suburban neighborhood. They are not aware that dog parks should be a place for dogs to have fun, not a place for dogs to be potentially mauled. And as crazy as I thought that first club-carrier was, I now realize that he had the right idea. The only problem I now see with carrying a weapon of that type, is that it is pretty much useless for the type of attack that people are likely to suffer. What good would a club be against a dog that already has a hold of your throat? Can you really swing a club effectively, in the direction of your own head? I guess it makes them feel safer. Why they don't actually do something that would make their neighborhoods safer, for them and their children, is obviously the elephant in the room. And the people here still can't figure out why people from other parts of the country stereotype them as being not-so-smart. I now have to carry a weapon myself to feel somewhat safer for myself, and my dogs. I insist my wife does the same (although I don't let her go for a walk without me, if it can be avoided). I don't carry a club. I am not happy about this situation at all. The pitbull situation here is absurd. The people carrying weapons are not.